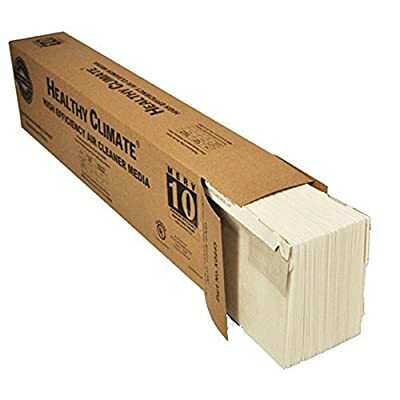 Heating, Cooling & Air Lennox X0445 PMAC-20C Replacement Filter 25" x 20" x 6"
Lennox X0445 PMAC-20C Replacement Filter 25" x 20" x 6" Lennox X0445 Healthy Climate PMAC (Pleated Media Air Cleaner) MERV 10 replacement furnace filter Fits the larger PMAC-20C model Filter dimensions: 25" x 20" x 6" Actual size: 19-3/" x 24-1/2" x 6-3/8" The Lennox X0445 Healthy Climate boxed media air cleaner has MERV 10 filtration to capture particles down to 0.3 micron. In most home environments, it only needs to be replaced every 12 months. This is an excellent filter for someone who wants a significant upgrade over standard fiberglass filters from the hardware store. The X0445 is a direct replacement for the Aprilaire / Spacegard 201 filter media used in the air cleaner model 2200/2250.